It’s been just over a year since Matters in Gray partnered with Sustainable Salons Australia (SSA)…and we’ve loved every minute of it! “MIG has a very collaborative relationship with SSA,” says Anthony Gray. “The ease of the relationship stems from the fact we share similar feelings on education and growing our industry. 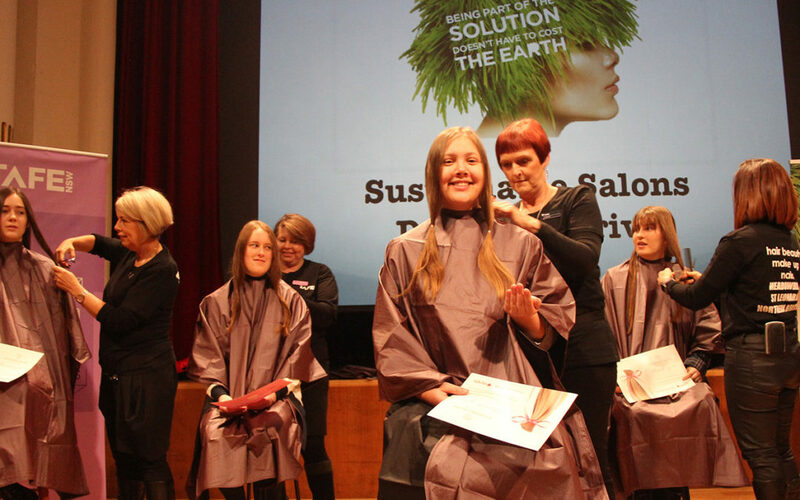 For Paul, Ewelina and the SSA team, the education of young hairdressers in sustainability is the way to a better future, so engaging with RTOs like ourselves to spread the sustainability message is core to who they are. We caught up with the undisputed king of curls and SSA boss man Paul Frasca about the importance of working with RTOs and what projects SSA has coming up next. MIG: How many RTOs and colleges do you partner with? PF: We work with many RTOs across all states and we have more than 20 on our program around Australia. MIG: What kinds of initiatives do you work on together with RTOs and colleges? PF: There are a number of different projects and events. One of the key ones is working with colleges and local girls high schools, such as the one we did with Matters in Gray last year at Redeemer Lutheran College in Brisbane. 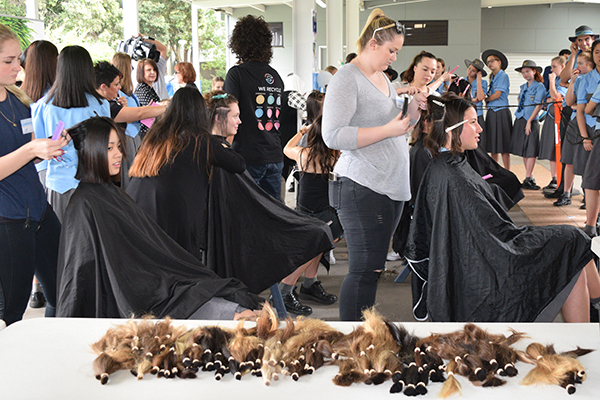 A number of students agreed to cut off their ponytails so they could be donated to children with alopecia and cancer and raised sponsorship money for doing so. MIG provided the hairdressers and students and we provided the recycling and distribution services for the hair. These are great events with a lot of heart and the schools really get behind them. Why these fundraisers are so important is that this type of hair – from girls between the ages of 14 and 18 – is the highest quality of hair needed for wig making. And 95% of it is uncoloured, making it very valuable. MIG: What are some of the ways that MIG is becoming more sustainable? PF: At the moment, we are helping the MIG team recycle a lot of their unwanted materials. For example, Anthony has lots of boxes full of papers from years of overload and doesn’t really know what to do with it all. We can deal with that through our program. We sell off that paper and all proceeds go to OzHarvest to feed the homeless. We also recycle any dolls heads from the college. We give them to charities such as Hair Aid, which uses the dolls heads for training, or we send them to art groups for use in art projects. MIG: What are your objectives working specifically with RTOs? PF: Ensuring they have our service running inside their RTO is number one. 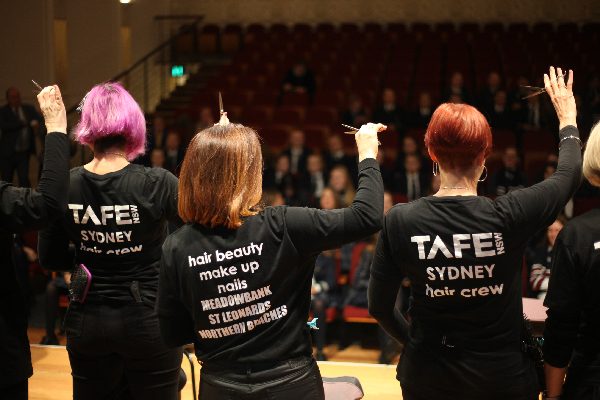 It links really well with the unit called ‘Participating in Environmental Practises’, which is a compulsory unit for students undertaking a Certificate III in Hairdressing, so they can see in real life what it’s like to do this type of recycling inside their environment. On top of that, it’s also now keeping RTOs at the forefront of sustainability prior to these students going out into the workforce. At work these days, all they hear about is ‘green this, sustainability that’. So making sure schools are at the forefront and covering it first before the students go out into the workplace really helps them get a clear understanding of what it actually means to be properly sustainable…because we all know that out in the consumer world there are so many mixed messages. The most important place to learn about sustainability has to be at school level. MIG: What are some of the other initiatives you are doing with different RTOs around the country? 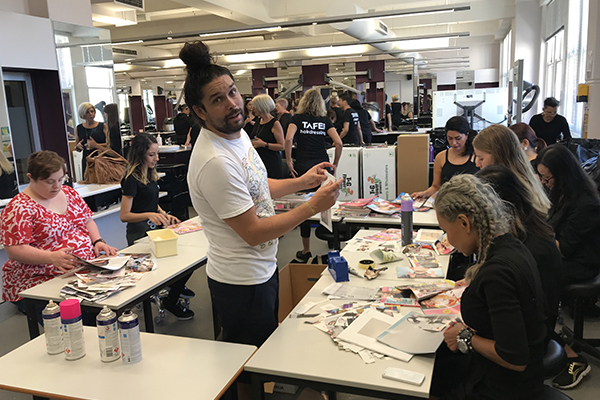 PF: Recently we had students from a Brisbane college make recycled table centrepieces for the Australian Hair Industry Awards from old HairBiz magazines. That was a creative project and lots of fun. 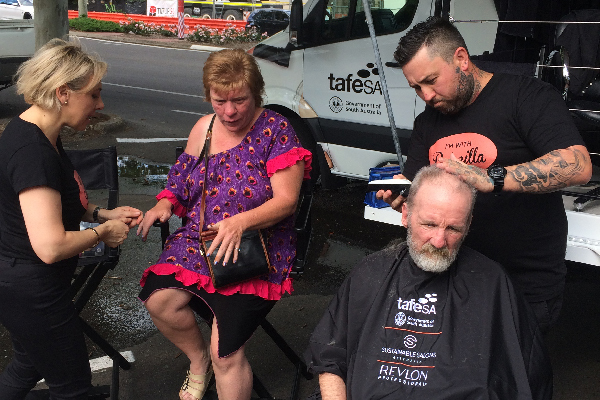 At TAFE South Australia, we have a bus called Priscilla that goes out monthly to different shelters to give haircuts, so we get the students to come along and help out and be part of the whole experience of giving back to the community. It’s a really exciting project. MIG: We hear you’ll have a big presence at Hair Expo this year? PF: Yes it’s a huge initiative with Hair Expo. We are actually partnering with them for the next four years, working together to make Hair Expo a sustainable event by 2020. It’s about getting everyone really focused about little things that have a big impact on the environment, like disposable coffee cups and plastic water bottles. More than 20,000 cups of coffee will be consumed at Hair Expo over the three-day period and in excess of 20,000 bottles of water. Instead of all that rubbish going into landfill, we can now divert it. On top of that, we are looking at all the waste going in and out of Expo during the bump in and out. We are building some strong initiatives for the following year, so there’s a lot to come in that space.